First Floor 1836 sq. ft. Depth 34 ft. 0 in. Approx. Height 19 ft. 11 in. 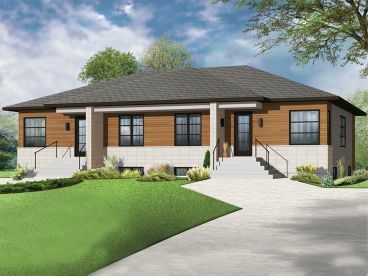 Property owners will love the contemporary look of this multi-family home plan. It features plenty of modern styling that is sure to get the attention of passers-by. Inside both units, the family room, dining area and island kitchen combine to create an open and free flowing floor plan that is flexible enough to handle everyday happenings and special get-togethers. Don’t miss the breakfast bar and backyard access from the kitchen. Two bedrooms share a full bath. Thoroughly modern inside and out, this duplex house plan is ideal for rental property.